It’s year 109 post-Big Bang, and the galaxies are awakening. It’s a busy time of growth in the life of our universe’s galaxies. Galaxies are booming with new stars—star formation is going to peak in a billion years or two, then drop precipitously thereafter. Also growing heartily are supermassive black holes, buried deep in the heart of each massive galaxy. Some are already a staggering billion solar masses. In a billion years or so, they too will be undergoing peak growth. It’ll never quite be the same again in the history of the universe, nor in the lives of its then-adolescent galactic citizens. This era of growth is one in which some of the brightest galaxies we know of have been found. The brightest galaxy in the universe that we know of to date, W2246-0526, lives at a redshift of z ~ 4.6 (about a billion years after the Big Bang) and radiates at an astounding rate of 3.5 x 1014 L☉, about 10,000 times brighter than a typical star-forming galaxy you’d see today, such as the Milky Way. Its cryptic name hides a clue to why it’s so bright—its first letter is an abbreviation of the name of the telescope that discovered it, the space-borne Wide-field Infrared Survey Explorer (WISE), which was designed to image the entire sky in the infrared and find the most luminous infrared galaxies in the universe. W2246-0526, in fact, appears to radiate almost entirely in the infrared, unlike typical galaxies, which prefer to radiate at visible and UV wavelengths. Infrared emission is typically radiated by hot dust, thus the galaxy has been classified as a Hot Dust Obscured Galaxy, or Hot DOG for short. What heats up all that dust? At the heart of such galaxies is a supermassive black hole that’s consuming the gas surrounding it, a system called an active galactic nucleus (AGN). As the gas is consumed by the black hole, the gravitational potential energy lost by the gas is converted in part into heat, causing the gas to heat up to millions of degrees. Gas this hot glows bright in visible and UV light. The staggering amounts of dust surrounding a Hot DOG absorbs the light, however, but reemits it in the infrared, giving rise to Extremely Luminous InfraRed Galaxies (ELIRGs). Given the extravagant luminosity of W2246-0526, it must be illuminated by a powerful AGN, powered by a ravenous and rapidly growing black hole. But rapid growth is often accompanied with growing pains, a rule from which galaxies not exempt—the black hole draws the material it accretes from the same reservoir from which its host galaxy forms stars. Thus both the galaxy’s AGN and star formation may shut off quickly thereafter. At what stage might W2246-0526 be in this process? The authors of today’s paper sought to answer this question by mapping the galaxy’s star-forming gas, the interstellar medium (ISM). To do this, they imaged the galaxy in one particular emission line of singly-ionized carbon by which much of the ISM cools, thus making it a good tracer of the ISM (see these notes, starting on page 4, for more details). What they found was striking. 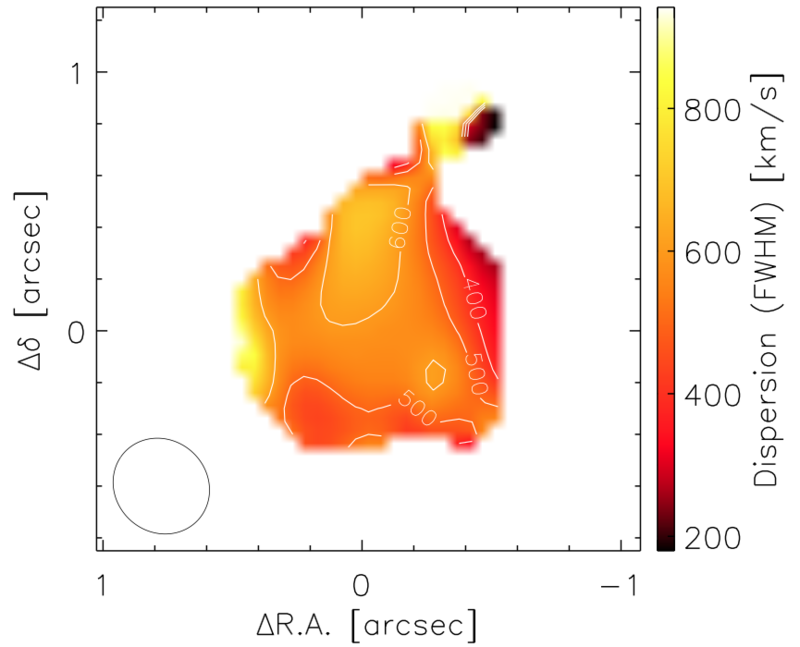 They derived the projected velocity profile for the galaxy, which revealed that it exhibits minimal rotation, indicating that there is no significant disk (see Figure 1). In fact, the velocity dispersion—a measure of how randomly the gas is moving, typically small compared to the rotation velocity for a typical spiral galaxy—was found to be larger than the rotation velocity (see Figure 2), and among the highest observed in any galaxy. High velocity dispersions can signify that the gas is extremely turbulent. 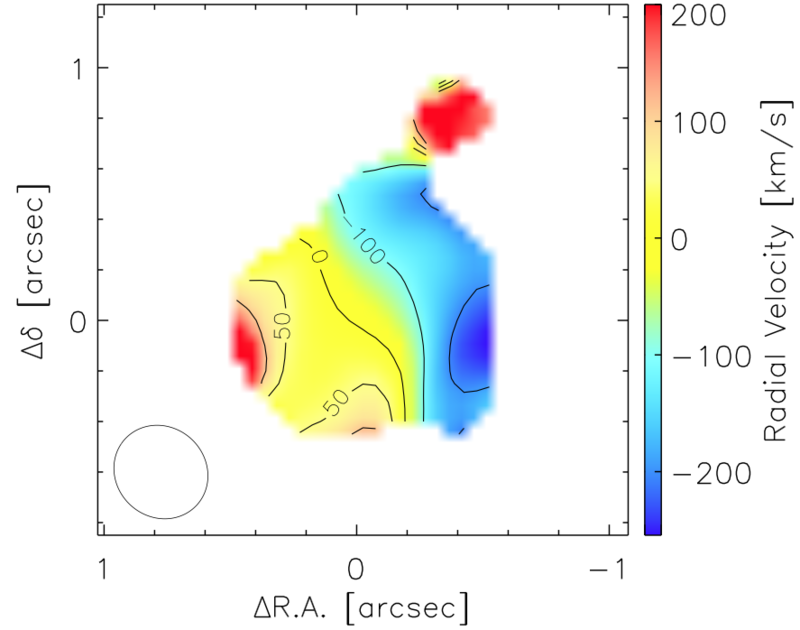 But that wasn’t all—the authors found that the velocity dispersion was surprisingly uniform, indicating that the highly turbulent gas must fill the galaxy up to several kiloparsecs from its center, possibly by expanding isotropically. Figure 1. The projected velocity map of the interstellar medium of W2246-0526. Calculated based on a map of [C II]. Note that the the projected velocity is at most 150 km/s. The red clump at the top may be a smaller galaxy in the process of merging with W2246-0526. The circle at bottom left depicts the image resolution. Figure 2. The velocity dispersion profile of WW2246-0526. Again, the velocity estimate has been derived based on a map of [C II]. Note both the high velocity dispersion (FWHM ~500-600 km/s) and that the high velocity is uniform across the entire region. Why might W2246-0526’s ISM have the shape and dynamics that it does? The authors point out that the galaxy is so luminous that its central AGN can blow the dust surrounding it out by force of the light it radiates. They also point out that should the AGN transfers even 10% of its energy to the ISM, it’ll cause an isothermal bubble of gas to expand isotropically. Thus the gas and dust isn’t stable—it’ll soon be blown away, lifting the heavy cloak of dust that surrounds the fiery AGN inside. It looks like we’ve caught the most luminous galaxy in the universe at a special phase in its life, a point where it’s on the brink of emerging from its dusty cocoon to become an unobscured AGN shining in its native optical and UV light.